For older news posts, please see news archives. Keep up to date with the Wantage Township Office of Energy Management Facebook page. The County is in short supply of poll workers. The day is long, but you earn $200 each election. New PW training classes are scheduled for March 29, March 30, April 9, April 11, April 23, and April 27. If interested, call 973-579-0950 x 4 or email to SussexPWInfo@gmail.com. Please be aware of your surroundings and potential wildlife around you. Click here for some coyote precautions to remember. CR 565 at the bridge site continues to be closed to traffic due to the replacement of the bridge. Originally scheduled to be completed in December 2018, the timeline for the bridge replacement project has been extended due to weather issues. Click here for the January 7, 2019 updated report on the project. Get the latest news on this project from the Sussex County Government website and Facebook page. The Friends of the Sussex-Wantage Library sponsor monthly exhibits highlighting local history. If you have an idea for a future display, or a collection you would like to exhibit, please call Barbara Young at 973-875-7864. Jersey Central Power & Light (JCP&L) reminds customers that they need to be aware that individual outages to their homes may require an electrician and inspection before service can be restored. For information that helps explain what equipment customers may need an electrician to address before restoration can be completed, click here. Working as a Community to Eliminate Hunger. Drop off your donations at the Wantage Town Hall, Monday through Friday, 8:30 to 4:30. Donations to benefit the Sussex County Social Services Food Pantry. All food collected in the food drive will provide emergency assistance to Sussex County residents in need. Thank you. Flier. Complaints continue to be received from residents in various areas of the Township about illegal use of ATVs and dirt bikes on public roads and other people's private property. It is important for the message to be carried: Individuals violating this law will be prosecuted. If youths are involved, their parents will be held accountable. PLEASE! It is a matter of safety. It is a matter of courtesy. And IT IS A MATTER OF THE LAW. Keep ATVs and Dirt Bikes off public roads and property, and off the private property of people who have not given you permission for the use of their property. Are you affected by addiction and don't know where to go, what to do? Drop in to speak with a recovery coach. Download flier. Call 844-722-5327. Girls on The Run spring registration is open. Visit gotrnjn.org to register. To register online or for more information: highpointsoccer.org or Facebook page. Celebrate Earth Day through stories and a hand-print craft. For children in ages 2-5. This program will meet at 10:00 a.m. and again at 11:00 a.m. in the library’s smaller meeting room. Register for one of the sessions at the library's front desk. The Cover-to-Cover Book Club meets on the fourth Wednesday of the month in the Community Room. No registration required. Come be part of the discussion. For more information call or email club founder Jane Casale at 973 827-5170 or hanna05@ptd.net. Cynthia Rauth, staff horticulturist from Andersen Farms, will demonstrate how to assemble planters using repurposed items to create unique containers that reflect your personal style. Whether you have a sunny deck, shady porch, or want to grow fresh herbs near the grill, Cynthia will spark your imagination and give practical tips on planting and caring for container gardens. Seating is on a first-come basis. No registration required for this free program presented by The Friends of the Sussex-Wantage Library. For further information, please call the library at 973-875-3940. The path to homeschooling is fraught with questions: Am I qualified to teach my children? What about socialization? Will my children be perceived as strange? How do I do this? Sally Stansfield, seasoned homeschooler and mother of eight, will address these questions and any other concerns you may have about homeschooling. Bring your questions and a notebook. Registration begins April 20. Free. Barn and yard sale, rummage sale, lunch booth, and bake sale. For more information call 973-875-5852. Saturday, May 4, 1 to 4 p.m. Meet on the beach at Lake Marcia. This year, the Friends of High Point State Park cleanup is through the NJ Clean Communities program, which will provide a generous donation to the Friends of High Point State Park for every participating volunteer. Trash pickup will be along the shores of Lake Marcia, Steenykill Lake, and Sawmill Lake. Participants may get wet and dirty so wear appropriate clothing and footwear. Participants should bring their own waterproof footwear, hip-waiters, and work gloves if they have them. No swimming permitted. Individuals, families, and groups are welcome to participate. Call 973-702-0488 for more information about the event. To learn more about the Friends of High Point State Park, visit friendsofhighpointstatepark.org. Join the Friends of High Point State Park volunteer Rob Oleksy on a bike ride to view emerging spring foliage and flowers along an eight-mile loop on Sawmill and Park Ridge roads. A few shorts stops will be made along the way to view points of interest and to enjoy a quick snack. For riders ages 14 and older. Helmets are required. Bring bicycle, helmet, water, and snack. The group will meet at the Sawmill Lake parking area. No rain date is scheduled. The event is free, but a suggested $5 donation per participant is appreciated. Please email Rob at rthawk@ptd.net for more information and to register. To learn more about the Friends of High Point State Park and their events, visit friendsofhighpointstatepark.org. Teens in grades 7-12 are invited to participate in a three-week sewing class to make and decorate a basic tunic for your cosplay wardrobe. Schedule: Week 1 (5/15) – design your pattern and cut the fabric; Week 2 (5/22) – sew the tunic together; Week 3 (5/29) – decorate and model your tunic. We have two sewing machines, thread, scissors, and trims. Some fabric available but you can also bring your own for a more personal design. You’ll need 1¾ yards. Space is limited to six teens. One-time registration begins May 1 and covers all three classes. Hit the road, the rails, or the high seas at this month’s sing-along. Songs will be about Casey Jones, hauling the main sail, row-row-rowing your boat, and navigating the treacherous Erie Canal, among others. Join in, raise your voice, and have some fun. Led by Walt Houck and his magic watermelon ukulele. All ages welcome but children must be accompanied by an adult. Grab a friend and raise your voices in song! No registration required. This free program is brought to you by the Friends of the Sussex-Wantage Library. Lusscroft Farm kicks off its 2019 Barn Sale Season with an amazing, fresh inventory. The barn is filled to capacity with rows of fabulous furniture (bring your truck), collectibles, antiques, framed art, housewares, books, lighting, crafts, jewelry, games, tools, and much more. Don't miss this one...YOU name the price! There will also be a plant sale and bake sale. Free admission, free parking. Cash or check only. For the benefit of restoration of Lusscroft Farm. Presented by The Heritage and Agriculture Association, Inc., in cooperation with the NJ DEP/Division of Parks and Forestry. For more information go to LusscroftFarm.org, call 973-288-2760, or email LusscroftFarm@gmail.com. Learn to make pie crust that comes out perfectly every time. You’ll never buy frozen crust again! Note-taking is encouraged so don’t forget to bring a notebook. Demonstration followed by a tasting of pastry-based dishes. Presented by Sally Stansfield, aka the Brit Lady. Registration begins May 4. The Friends of the Sussex-Wantage Library are sponsoring two watercolor classes today; the first at 3 p.m. and the second at 6 p.m. The classes are identical and limited to 15 adults for each session. Each class will led by professional artist and “Brit Lady,” Sally Stansfield. Sign up is in person at the library beginning May 15. A $5 materials fee will be collected at the start of class. Please bring exact change. Learn to sew. From threading the machine to tying off the final stitch, instructor Ellen Lumpkin Brown takes you step-by-step through the process of making your own Boxy Market Tote Bag complete with pockets. Ellen brings the fabric, sewing machines, and know-how. No previous sewing experience required. Space is limited to 12 participants, ages 14 through adult. Registration begins May 11. Before television, radio, or print, we used face-to-face oral language to communicate, educate, impart values, and entertain. Master storyteller Ken Karnas continues that tradition with folktales for adults, including “Old Frost and Young Frost” from Lithuania, “Tia Miseria” from Portugal, and other around-the-world stories of Elders and their wisdom, humor, and honesty. Join the Friends of the Sussex-Wantage Library in the Community Room for this free program. No registration required. Seating on a first-come basis. Light refreshments to be served after the program. Entertainment, food, and activities. Classic motorcycles welcome! Pre-registration by June 10 is $15; day of show is $20. A portion of the proceeds to benefit the Sussex Elks Lodge Veterans Committee. 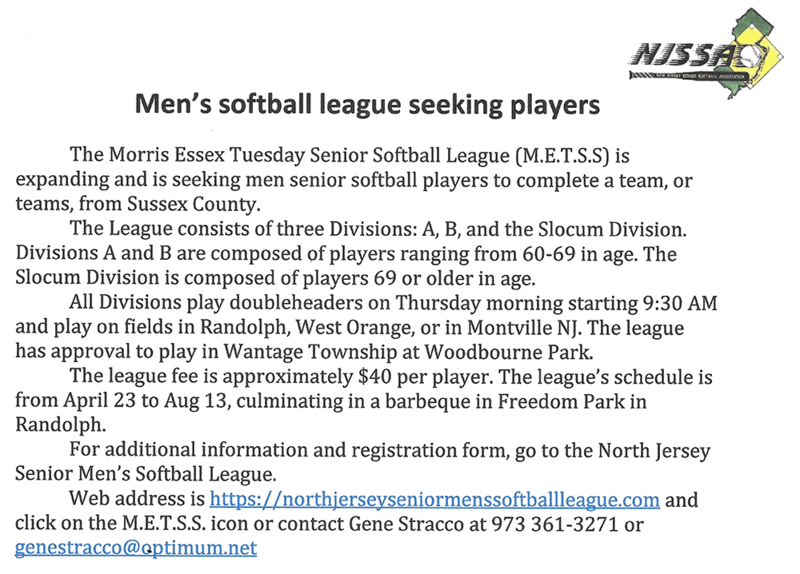 For more information call Patty at 973-875-3990 or email SussexElks2288@gmail.com. Featuring PGA Mary Beth Kohberger. For boys and girls in grades third through ninth. Cost is $100. For more information contact Bill Percey at 973-875-3101 ext. 3562 or email wpercey@hpregional.org. Click here for flier and registration form. E-mail your organization's upcoming events, news, and photos to share with our community.